Well-performed card tricks are always entertaining to watch, especially when a measure of spectacle is added to the trick. Relocating a selected card is marginally impressive, but making that card appear to jump out of the deck takes the trick to another level. One of the wonderful things about this trick is that it doesn't require any invisible string, long sleeves or any other preparation to speak of—just plenty of practice. Ask your audience to stand in front of you on the other side of the table. 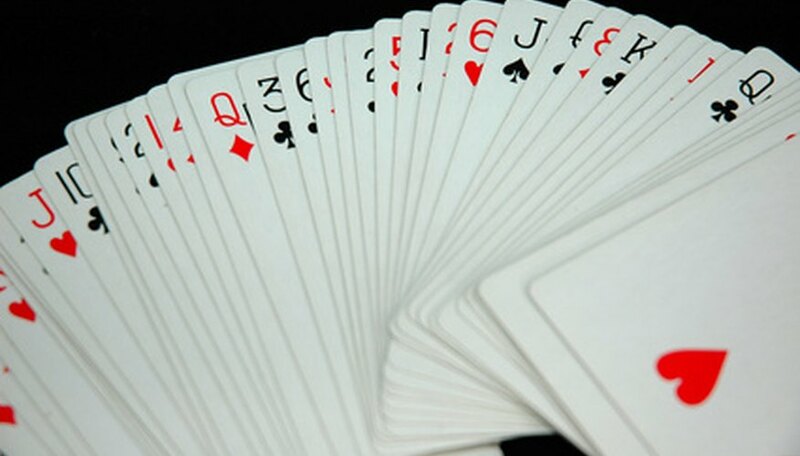 Shuffle the cards on the table two or three times to demonstrate that the deck is not rigged in any way. Fan the cards facedown in your hands and ask an audience member to select a card. Ask the audience member to show the rest of the audience the card. Take this opportunity to flip the entire deck face up in your palm. After doing so, flip over the topmost card. As a result, the deck appears to be facedown, when in reality only the top card is facedown. Hold out the deck and ask the audience member to insert her card facedown into the middle. Turn your back to the audience. As a result of your clever sleight of hand in Step 4, there are only two cards in the deck flipped in the opposite direction than the rest: the topmost card and the participant's card. Flip over the topmost card and pull out the participant's card. Place the card facedown on top of the deck. Slide it forward lengthwise about 1 inch. Face the audience and hold the deck 3 feet above the table. Drop the cards as flatly as possible. When the deck hits the table, the slightly overlapped top card (the participant's card) will flip off the deck onto the table. To the audience, it will appear to leap from the deck of its own accord. Practice this trick over and over in front of a mirror until you can practically do it blindfolded. While this trick doesn't require any rigging, you will be doing the sleight of hand in full view of your audience. As such, you will need to be confident and quick with your trickery.